Last Sunday I posted about "Nudging the Network and pointed to connections I've made since 2013 with educators from around the USA and the world via the Connected Learning #clmooc Network. Today I found this Tweet from Terry Elliott, a college professor from Kentucky, in my feed. Last week I had sent Terry and a few others a post card that I'd created from a cMap, to thank him for his personal encouragement, idea sharing, and for his 2018 financial support. 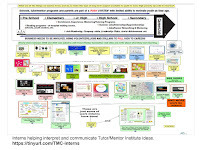 I opened Terry's blog to read his article and saw that he had created the video below, to guide viewers through my cMap. Terry did what I keep hoping many others will do. 1) he read my post; 2) then he wrote something about it on his on blog; 3) then shared that via his social media. 4) And, he sent me a contribution in 2018 to help me pay the bills! So, let me put this in context. Below are two images I found yesterday on the America's Promise Twitter feed. The first shows that the US high school graduation rate flattening out over the past two years, at around 84%. . The second shows that the groups still not graduating at the national average, or who represent that other 16%, are kids from poverty areas, minority groups, ESL groups, and those with special needs. I've been using maps since 1994 to try to focus attention and resources to areas where these student are most concentrated. 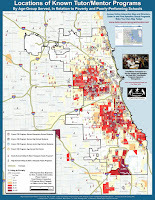 Between 1994 and 2015 (when I ran out of money) I used conferences held in Chicago to try to bring people together to talk about ways to build and sustain youth tutor/mentor programs in high poverty areas. Since 2005 I've used this blog to focus attention on these areas and to stimulate thinking of ways people who don't live in poverty can help build systems of support that help kids move more successfully through school and into adult lives, with jobs, and free of poverty. Between 2006 and 2015 interns from various universities spent time looking at the ideas I have been sharing, then created their own interpretations, just like Terry Elliott has been doing. I created this cMap to highlight work that was done. I point to it as an example of what many could be doing, not just Terry Elliott and a few others. After seeing the posts about high school graduation, I posted a few Tweets asking "does anyone have maps showing individual schools, not just aggregated state-level information?" 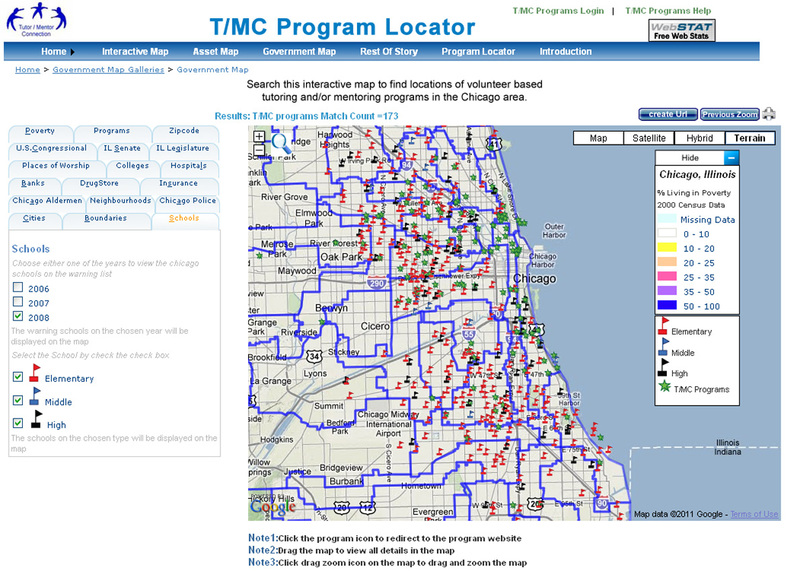 The map at the right shows 2007 low-performing public schools and was created using the interactive Tutor/Mentor Program Locator, which we built in 2008-9. It is an example of what I would like to find in 2019. Here's an article where I use this map. Maybe someone can use this to ask questions of the candidates running for election in 2019. First, I don't find many people digging into my articles the way Terry is and my interns did. I created another cMap to point to other articles by Terry, along with some by others who are taking a similar role. Second, I don't find groups of people in on-going conversations, using many platforms, the way the #clmooc network does, to discuss issues like high school graduation, and who include maps showing where schools, and kids, need more help, or that map out steps to build the public will and funding needed to bring needed help to more places, and then keep it there for many years. 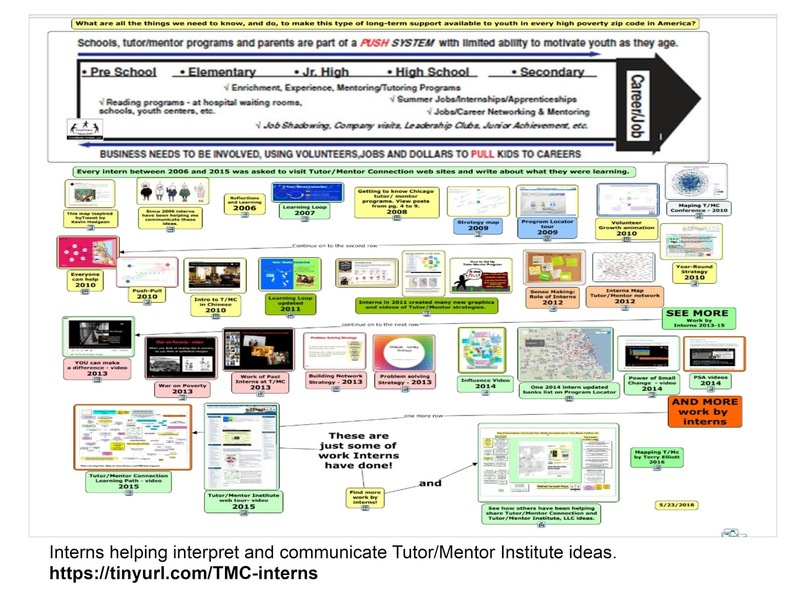 Finally, I don't find any people looking at my maps, and then talking about how to rebuild the Tutor/Mentor Connection mapping platform (which is now out of date), conferences, and on-line network building efforts. And as people launch new initiatives intended to improve graduation rates, reduce violence and inequality, etc. few are reaching out to learn from ideas I've been sharing or to ask for my advice. So, thanks Terry and others in #clmooc for your efforts and your financial support. If you've read this and want to add your own support, click here for information. Anything I can do to help you Keep On!